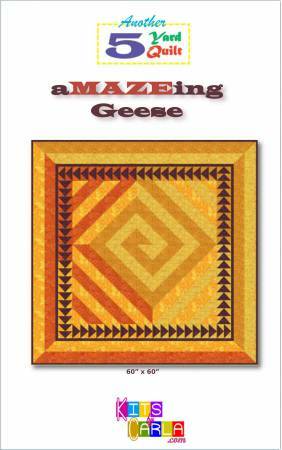 A square quilt that consists of 4” half-square triangles (HSTs) and 80 Flying Geese arranged in an outlining border. Both these types of units are made using the Shortcut Sheet method. Units are made by sewing strips, cutting rows, and sometimes cutting sewing rows. Sheets are then cut apart using a 24” quilting ruler. No "squaring-up" or pressing needed. Five fabrics, one yard of each, makes this convenient to select fabric from precut yardage bundles. SHORTCUT SHEETS: This pattern uses Shortcut Sheet methods for making half-square triangles (HSTs) and Flying Geese.